Pearl, MS -- Tickets for all possible 2018 Southern League playoff games at Trustmark Park will go on sale Friday, Aug, 31 at 10:00 am. 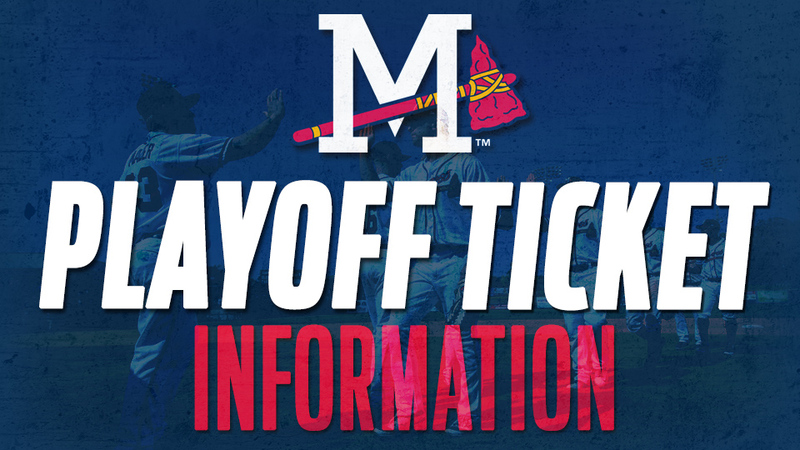 Fans may call 888-BRAVES4, visit mississippibraves.com or stop by the Trustmark Park Box Office Monday through Friday from 9:00 am to 5:00 pm to purchase their tickets. The Mississippi Braves are currently 1.5 games back in the Southern League South Division race for the second-half title and 3.0 games back in the wild-card race with six games to play in the regular season. If the M-Braves make the playoffs, they will host a minimum of one game and a maximum of six games at Trustmark Park. If any or all games are not played at Trustmark Park, purchased tickets will be refunded or credited towards 2019 season tickets. The Southern League Division Series and the BC Powder Championship Series are both best-of-five-game series. The Biloxi Shuckers, first half division champs, will host the first two games of the South Division Series, September 5 and 6 at MGM Park. Game three of the series would be on Friday, September 7 at Trustmark Park. If necessary, the M-Braves could host games four and five, September 8 and 9. TBD - Game 5 at Pearl (if necessary). The winner of the South Division Series will face the winner of the North Division Series to determine the 2018 Southern League Champion. The 2018 Southern League Championship Series is presented by BC Powder. The M-Braves have appeared in the Southern League playoffs four times, including a runner-up finish in 2016. The M-Braves claimed the 2008 Southern League Championship. Mississippi also appeared in the 2007 and 2013 South Division Series. The 2018 M-Braves have put themselves in playoff contention by going 31-22 since July 1, the third-best record in the Southern League over that span. The M-Braves will open a six-game series in five days on the road in Jacksonville beginning on Thursday. The series will open with a doubleheader, followed by a single game on Friday, another doubleheader on Saturday, off day on Sunday and the series and season finale on Monday afternoon. Pensacola will play their final series at Tennessee and Biloxi will play host to Birmingham. First pitch of game one on Thursday is set for 4:05 pm CT with coverage beginning at 4:00 pm on 103.9 WYAB, TuneIn Radio, and MiLB.TV.